This fall, Whitworth's forensics program is getting back in full swing after a 14-year hiatus. The rebirth of the program comes on the heels of a string of successful years for Whitworth students engaged in similar academic activities. Last spring, a team of Whitworth students tied for third place at the 15th annual National Intercollegiate Ethics Bowl. It marked the second time in three years that Whitworth had placed in the top five at the national bowl; Whitworth teams have placed in the top tier at regional ethics bowls for the past decade. "Whitworth is resurrecting the forensics program to provide academically talented students with a high quality co-curricular activity," says Mike Ingram, director of the forensics program and associate dean for faculty development and scholarship at Whitworth. "The new program will provide a rigorous intellectual experience for students across many majors." Ingram led the intercollegiate forensics program from 1988 to 1997, but budget constraints resulted in the program being discontinued. Ingram says that since the program ended, the Whitworth Admissions Department has fielded a steady stream of inquiries about whether the university has a forensics team. 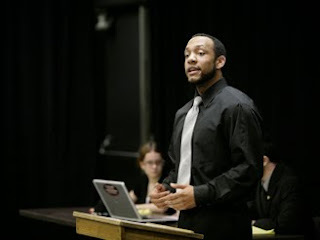 "Debaters and speakers tend to be very strong students interested in the exchange of ideas and in sharpening their public speaking abilities," Ingram says. "The goals of the program are to significantly enhance abilities in critical thinking and effective public speaking." Students participating in the program take a one-credit class, "Applied Speech: Forensics Class." The team will travel to regional tournaments in which they will compete against other schools in either four types of speaking events, two types of speaking on an assigned topic with only a few minutes to prepare, or five types of reading and interpreting pieces of literature. Students will also compete in debate, where they will work with a partner to argue for or against a resolution. This fall, Ingram plans to take a team of 10 students to three regional tournaments. Mike Ingram, associate dean for faculty development and scholarship, Whitworth University, (509) 777-4763 or mingram@whitworth.edu.